GrößenWahnsinn offers fashion fun for every figure and a first-class selection of well-known plus size designers and unique original pieces. From the chic beach dress to the noble business outfit to the sparkling evening robe, we offer women’s fashion in all its facets and sizes. Numerous accessories, bags and shoes complete our product range. On 100 square meters of shop space, women with plus sizes will find a rich assortment. We advice you warmly and competently. Your plus size shopping experience will be awesome! Look forward to a great selection of second-hand fashion and outletware from size 16 to XXXL! Read what our clients have to say about GrößenWahnsinn and have a look at us! Find out all about our conditions for consignment goods. 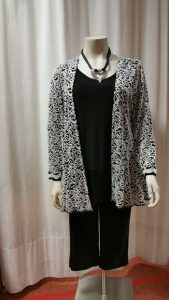 We have the right size - 1st und 2nd hand fashion in sizes 16 to 10XL. Review us and get a 30% discount!